MILAVIA is dedicated to military aviation. We offer a broad range of military aviation related content for the aviation fan. 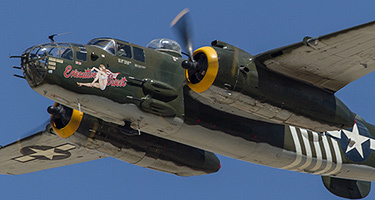 The Air Shows section provides the airshow calendar and air show reports with photos of the flying displays. The Aircraft directory focuses on modern combat aircraft; fighters, ground attack aircraft and bombers in past and present service. The Air Forces section provides focus articles on some rarely covered air arms. The Specials section has various military aviation articles and photo reports covering exercises, units, and more. And there is much more! Enjoy! The 2018 Piknik Lotniczy open day held on June 30 by the Polish Air Force 21. BLT Swidwin was a great opportunity to see the last remaining Su-22 'Fitters' in Europe. Report on the Israeli Air Force hosted multi-national exercise Blue Flag 2017, which included participating by 8 air forces and some 70 aircraft. European fighters and fighter-bombers joined the F-15 Baz, F-16 Barak and F-16I Soufa of Israel, all deployed at Ovda airbase. On May 5th, 2017, the official retirement ceremony of the Hellenic Air Force RF-4E Phantom II took place at Larissa air base. Along with the aircraft, the 348th TRS ceased operations indefinitely after 64 years of service. It was the end of the last Recce Phantoms remaining in Europe, the last Recce Phantoms of NATO. The end of the film!